Catholic News World : Wow Pope Francis Donates Incubators to Hospitals for Newborn Babies - A #ProLife Christmas Gift! Wow Pope Francis Donates Incubators to Hospitals for Newborn Babies - A #ProLife Christmas Gift! Pope Francis gives two neonatal incubators to Roman hospitals as a special Christmas gift, one of which will be sent to assist newborn babies in Ethiopia. Getting into the giving mood surrounding Christmas, Pope Francis has donated a pair of neonatal incubators to two Roman hospitals. The Pope’s Almoner, Cardinal Konrad Krajewski, delivered the gifts on Wednesday morning, and blessed them during a special ceremony. Incubator for Roman babies One incubator was gifted to the Fatebenefratelli Hospital on the Tiber Island, bringing its total of neonatal intensive care units to 30. In a statement, the hospital said it treats some 600 newborn babies in intensive care every year. Of these, around 80% are premature births of “extremely fragile yet amazingly strong babies who require very specialized care and constant love.” One for babies in Ethiopia Pope Francis gave the other incubator to the Vatican’s Bambino Gesu Pediatric Hospital. This Christmas gift will be sent to a hospital in Ethiopia, as part of a joint project with the Doctors with Africa CUAMM organization. 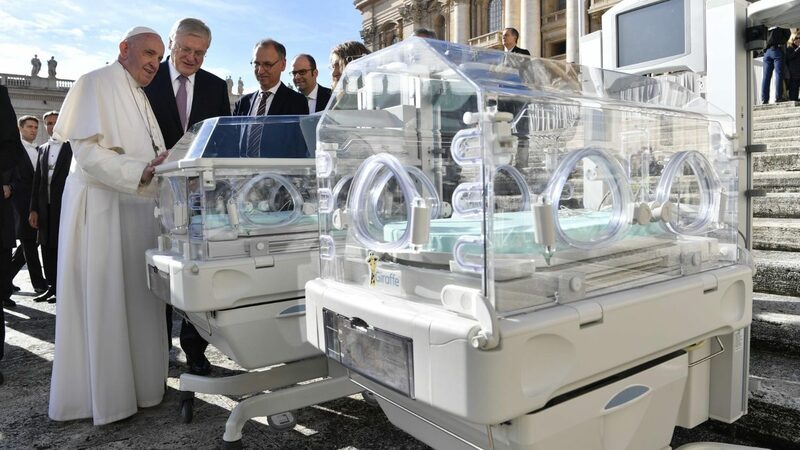 Pope Francis received the General Electric HealthCare neonatal incubators from representatives of Bayer, a pharmaceutical company, during the General Audience on 21 November.